An award-winning care home, which employs around 90 people, was nearly never built when bank lenders suddenly pulled out — the owners have revealed. But with a little help from Kerseys, the project got off the ground. Building was almost brought to a halt on the Baylham Care Centre, whose replica 1950s village high street made headlines earlier this year, when the recession hit and capital funding dried up. 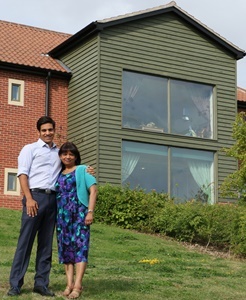 Adrian Fairburn and mum Prema Fairburn-Dorai, who had put £150,000 of their life savings into the project, were left devastated. Adrian, 33, said: “We had a number of interested lenders before the recession, but the collapse of Wall Street bank Lehman Brothers changed everything – they all pulled away, saying the existing plans wouldn’t be profitable enough. But then Kerseys solicitors, where Adrian works as part of the business development team, worked on meeting lender Natwest’s needs by changing the original plans. Ten extra bedrooms were added to the development- so it would be seen as a more sustainable venture. Kerseys then put forward a case for the family to reapply and ultimately succeed in securing a loan. Adrian said the company allowed him to work part time while he worked on the family-run care home. Adrian, who visited the site in 2007 with Kerseys partner Kimat Singh said: “It was just a field, but we had faith in our vision of what could be done. Cardinal Healthcare Group has residential and nursing care homes in Baylham and Barham in Suffolk. The Baylham Care Centre includes a post office, butchers, sweet shop and greengrocers, was built to help people suffering with dementia to help bring back some of their memories.